Whenever I ask people to think about their favourite films, it is a sure bet that Jaws will appear in their lists. Based on the book by Peter Benchley and directed by the legendary Steven Spielberg; the film has gone on to become iconic largely due to the music and the suspense created by Carl Gottlieb’s outstanding screenplay. It is well documented that Jaws had a few hick-ups along the way, from mechanical shark issues to an extended shoot period costing millions of dollars. Nevertheless, Spielberg knew he needed to focus on the screenplay, which at that point had gone through a number of writers and re-writes. Spielberg then turned to his good friend Carl Gottlieb who climbed aboard as shooting commenced with an unfinished script. However, signing Gottlieb to the production turned out to be the movie’s secret weapon as he helped to craft one unforgettable script . Not only is Carl famed for his work on Jaws and its sequels, he co-wrote the screenplay to one of the funniest films ever made The Jerk which stars the brilliant Steve Martin. Carl’s additional work included Which Way Is Up (1977), Caveman (1981) and Doctor Detroit (1983), in which the last two he directed. Carl, thank you for taking the time to speak with The Norwich Film Festival about your work. So our first question is…..
NFF: How did you get into the film business? And what was it that sparked your interest in screenwriting? CG: Like many people, I drifted into it as the result of other writing I was doing at the time. I was in Hollywood, writing and performing in variety television, I had friends in the film business, and one of them (Steven Spielberg) asked me to look at a script he was prepping. I had been paid to write several screenplays by that time, so the form wasn’t new to me. JAWS was interesting, there was a part for me as an actor, so I took the job on short notice, and the rest just followed. I had no “spark,” one thing led to another, and I knew how to write for performance. NFF: Were there any particular films/screenwriters that influenced your own work growing up? If so, how? CG: Growing up I was a fan of “boy’s adventure” films, westerns, war movies, comedies, and (of course) the “classics” (Ealing comedies, French “New Wave,” Italian neo-realism, all the celluloid that anyone with an interest in the arts could experience in New York City, where I was fortunate to grow up). NFF: When you saw the scripted draft of the screenplay Jaws what was it that excited you about the project? Did you know that you wanted to be involved as soon as Spielberg approached you? CG: If I may be honest, and frank, what excited me most about JAWS was that it was a “go” project; I knew it would be made, I knew I would be paid to work on it, what else matters? I have always gravitated towards projects that were funded and scheduled for production. NFF: The introductory scene of Jaws is one of the most intense openers in Cinema history. What was your process in creating that intense level of tension? CG: My process was to create a cheerful ambiance (“young people goofing around a campfire on the beach”), and a plausible scenario that would lead a young man to chase a young woman into the dunes with the hopes of a sexual encounter; he’s too drunk to consummate the relationship, she’s a “free spirit” who takes off all her clothes to plunge into the ocean. That was my job, and process. The sudden underwater attack by an unseen force is pure “cinema,” completely dependent on the artistry of the director, the music, and the editing; no “writing” needed, the level of tension to which you refer is achieved by purely cinematic means. NFF: What had been your biggest challenge in being involved with a project like Jaws? Conversely, what do you feel has been the biggest reward for you personally? CG: No challenge, except the brutal physical toll during shooting, when I was appearing onscreen as an actor, while at the same time struggling to complete revisions in time for pages to be distributed to cast and crew. Afterwards, when the glory and the success of the film was firmly established, my personal goal was not to be type-cast as a writer of shark movies, but a guy who knew how to get laughs and was steeped in the comedy tradition (which led to WHICH WAS IS UP with Richard Pryor, and my collaboration with Steve Martin on THE JERK). I would be lying if I didn’t admit that the creative connection to an iconic, universally recognized film was satisfying to the ego. NFF: From reading The Jaws Log, one of the area’s which became apparent was the collaborative process. Do you feel the film was more of a success because of the great collaboration from everyone involved? CG: Of course. I was writing material for actors I knew personally, whose innate speech patterns and habits could be incorporated into their dialog, which led to a great sense of authenticity. Similarly, I knew what technical difficulties the crew was facing, so I could write “around” shark malfunctions, boating accidents, inclement weather, etc. 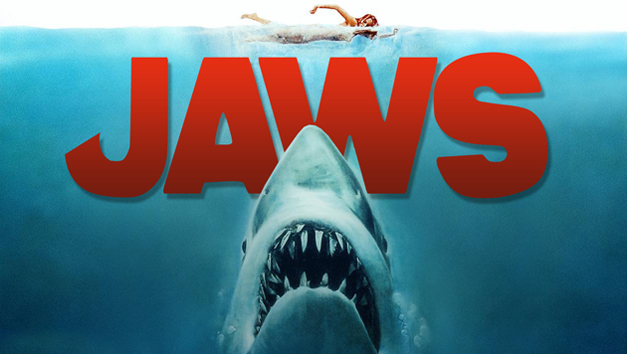 NFF: Looking back what was your favourite scene to write in Jaws and why? CG: I tend to favor scenes that are long on dialogue: the dockside reproach by Mrs. Kintner, the confrontation between Hooper and Mayor Vaughn at the billboard site, and, of course, the scene below decks on the Orca in which the men compare scars and Quint delivers the memorable “Indianapolis” monolog. NFF: In addition to writing the screenplay, you also had the opportunity to appear as Harry Meadows in Jaws. Where you ever tempted to write a bigger part for that character? CG: The part of Meadows WAS much larger in the script I was handed before shooting began. I take rueful pride in the fact that I actually had to cut my own character’s part to accommodate the needs of the evolving narrative. No greater sacrifice could be demanded of an actor/writer, and I did what was necessary to the success of the film. NFF: You also co-wrote and appeared in one of the greatest comedies of all time “The Jerk” with Steve Martin. Who originally sparked the idea for this film? And how did you and Steve become collaborators on this project? CG: I knew Steve and worked with him in television (we won an Emmy for our work on The Smothers Brothers Comedy Hour on CBS). We stayed friends, and when a forward-thinking studio executive named David Picker gave Steve a contract to write and star in his own movies, Steve asked me if I’d work with him again, seeing as how I had done JAWS and WHICH WAY IS UP, and had a great deal of experience writing comedy (I had written for Pryor, Lily Tomlin, Flip Wilson, Robin Williams and others). The basic story of THE JERK was the result of weeks of not knowing what to write about or how to start the story; one day, out of desperation, Steve remarked that a successful line is his act was “I was born a poor black child…” That rang a bell, and we turned to the so-far unused typewriter and began writing what would happen if, in fact, born and raised by black sharecroppers in the Deep South. NFF: Looking ahead, which screenwriters currently out there are you intrigued by and what is it about their work that excites you? CG: I’d rather watch a bad Coen Brothers film than a good film by anyone else; the same for Charlie Kaufman and Amy Schumer, genuinely creative comic voices. NFF: As a successful screenwriter, what advice can you offer budding writers out there? Do you have any top tips? CG: Attention, Budding Writers: You will be disappointed, disenchanted, and frustrated for your entire careers, even if you’re lucky enough to actually have a script produced. Your chances of having more than one movie made are slim, despite your talents and abilities. More likely, you will be simply unemployed as a writer much more than you will be working, unless you find your way onto a successful television series, which is where the best work is being done these days. There are fewer than 650 writers in all of North America who actually earn money writing screenplays, produced or not. The best dramatic and comic writing being done today is on television, not on the big screen. One might surmise that’s because in television, the Writer is King. In films, for historic reasons having nothing to do with talent, the Director is God-King, and that might have something to do with it. Directors are not auteurs, Authors are Auteurs (look it up in your French-English Dictionary). Directors are the indispensable artists who bring a screenplay to life, they are the most important collaborators in the film-making process, and they are “artists of interpretation,” like orchestra conductors. Writers are “artists of original creation,” without them there’s nothing. Some of the best films have been made by writers and directors working together to realize a common vision. Finally, if you would like to learn more about Carl Gottlieb Jaws experience, the Norwich Film Festival highly recommends The Jaws Log, available now.